The humble food processor is one of the most magical and versatile appliance you can own in the kitchen. Unlike a blender, it doesn’t require any liquid to chop up its contents, which means you can grate up pretty much anything! 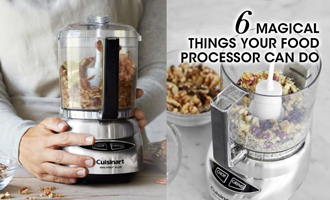 If you don’t have a food processor already, try the Cuisinart Mini Prep Plus Processor. From the main course to healthy desserts, it’s incredible how much one appliance can do! You’ll definitely want one once you see the 6 amazing ways you can use it below! Need to cut butter into flour to make that pie crust? Let your food processor do the work! Even, flaky, buttery crusts in half the time! Here’s a Chicken Pot Pie recipe that will be a dream to make! Add all ingredients (except olive oil and salt & pepper) into your food processor. With the motor running, add olive oil in a slow stream until emulsified to your desired consistency. Season to taste! Toss your pesto into pasta, or serve it with steak, like this Grilled Steak with Pesto! What can we say? Nut butter is too easy not to make your own at home. Customise it to your heart’s contents and you will never have a dull breakfast! With a simple jar of nut butter, you can spread it on toasts, turn it into peanut sauce, and even use it in salad dressings! The possibilities are really endless. You can also mix and match – if you have a few handfuls of different nuts, try blitzing them together to see how they taste! Here’s how: Add your nuts into your food processor, along with a good pinch of salt and any flavours or sweeteners if you’d like. Shredded coconut or maple syrup maybe? Pulse to combine, taste and season to your liking! On a quest to healthier baking and eating? Try substituting plain flour with oat flour. Not only are they more filling, but they’re high in fibre and protein! A great alternative to highly processed flours you get from store-bought flours. We recommend using this oat flour in pancakes and muffins. Since it’s gluten-free, bear in mind that it will not have the same binding ability that white flour provides in baked goods such as bread and cakes. To make your very own homemade oat flour, simply pulse your steel-cut/traditional rolled oats into your trusty food processor till the oats resemble fine crumbs/flour. Try it with our Blueberry Pancakes recipe this weekend! Using a food processor to make baby food at home allows you to control the quality of food your baby eats. In addition to having the ability to guarantee the freshness of your child’s meals, you can also save money by eliminating the extra costs of buying pre-packaged foods. Start by steaming your fruits or vegetables of your choice. Separate the liquid that the foods produce during the cooking process. Begin pureeing the fruits and vegetables in your food processor and add in the liquid that you set aside to your desired consistency! You can now have your own cookie crumble in a matter of seconds! Use it as a foundation for a delicious pie, or sprinkle over ice cream, froyo or your other favourite desserts! Simply add your favourite cookies into your food processer, hit pulse and you’re done! Try using your cookie crumble with our recipe for a delicious No Bake Strawberry Cheesecake! 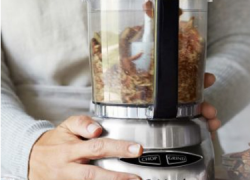 The Mini-Prep® Plus is the perfect little helper for small food preparation, from chopping herbs or bread crumbs, to finely grinding hard cheese. Its versatility lies in the special Auto Reversing Smart Blade™, which makes it easier to process both soft and hard foods. Designed in Italy, the Mini-Prep Plus’ sleek touch pad controls afford easy cleaning and an elegant look. Get yours now at ToTT Store! Surprise your valentine with 6 perfect gifts!